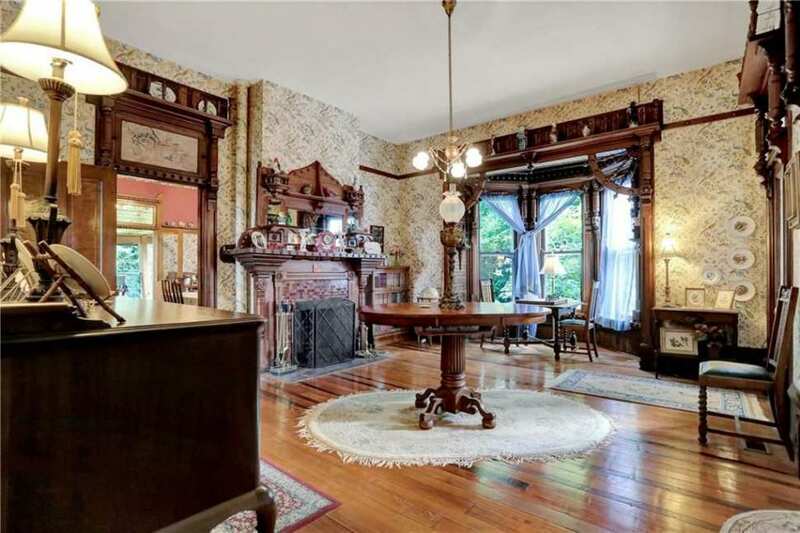 Historic brick Italianate home with 6 bedrooms. 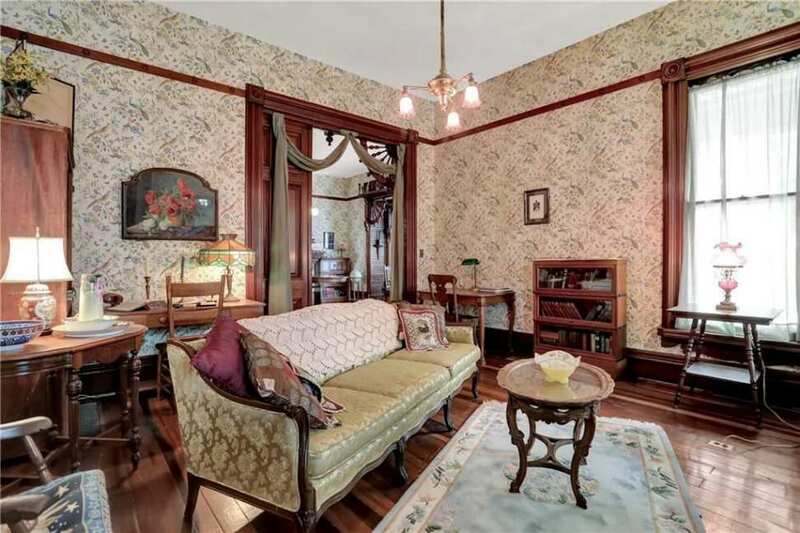 Detailed ornate woodwork, hardwood floors, 3 fireplaces, 2 staircases, original oil painted transoms above doors. Updated kitchen and baths. Backyard certified as Wildlife Habitat. 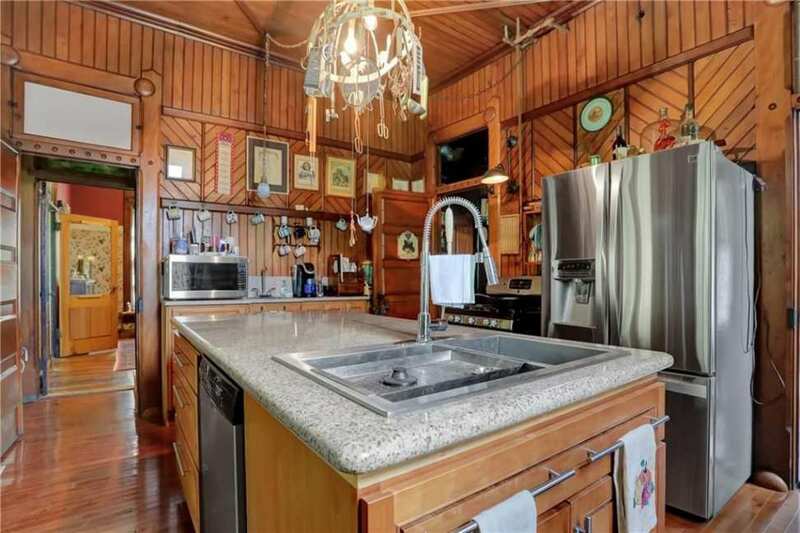 Country feel with the conveniences of being in the city. Endless possibilities for this home. Must see! Yes, please! I love the playfully exuberant woodwork… pure fun! 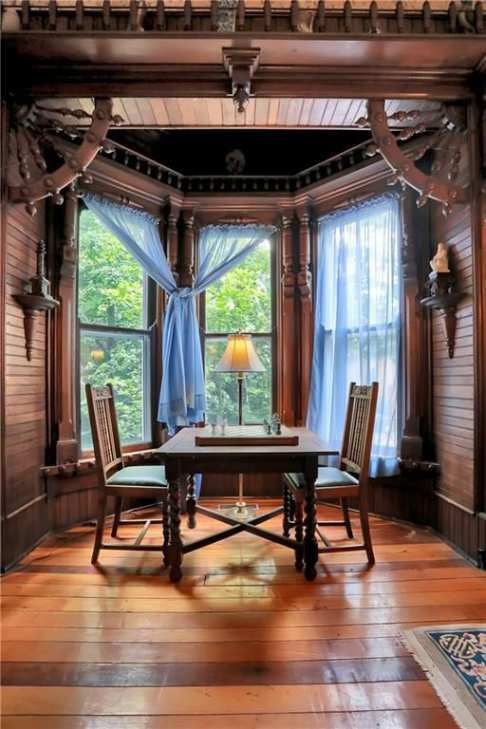 The woodwork in this house is amazing. Fortunately it was spared during the “Great American White Out” The radiator in the dining room has doors on it. Plate warmer perhaps. Unique and still in the house. I usually do not care for porch conversions. This one is unique overlooking the habitat in the back yard. Great Kitchen. 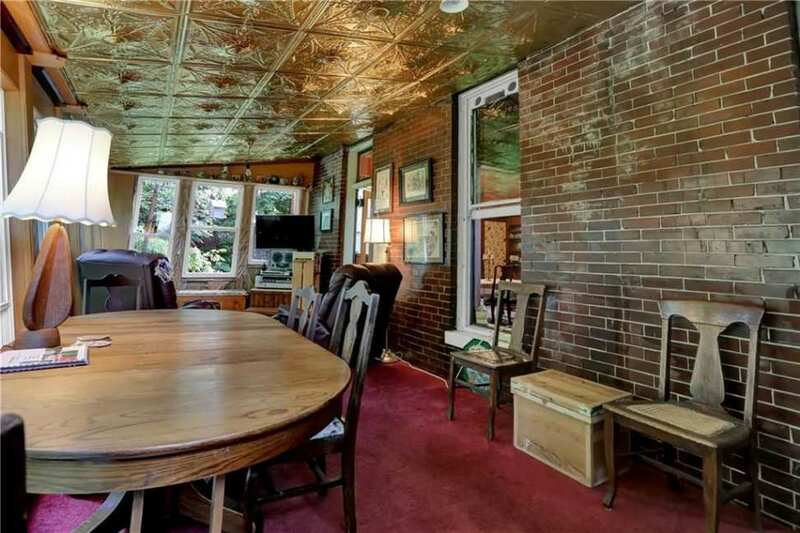 There is a lot to like with this house. Oh, my. Well, this is definitely unique and I love most everything about it. The woodwork is really special. 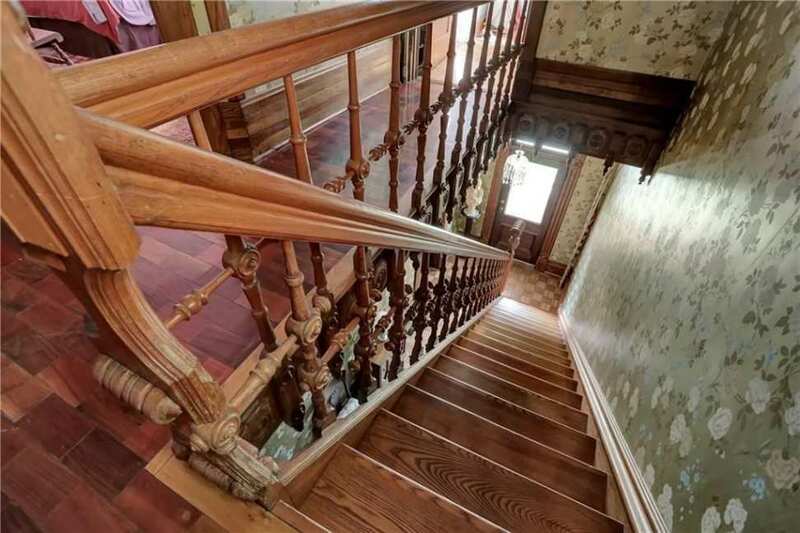 That is the most unique stair baluster I have ever seen. 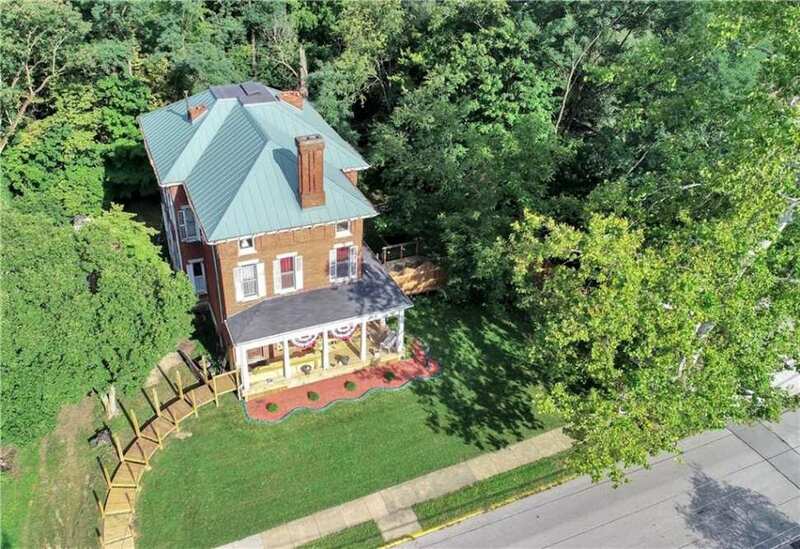 I would have to do something different than that circular decked walkway, but otherwise the house is great. 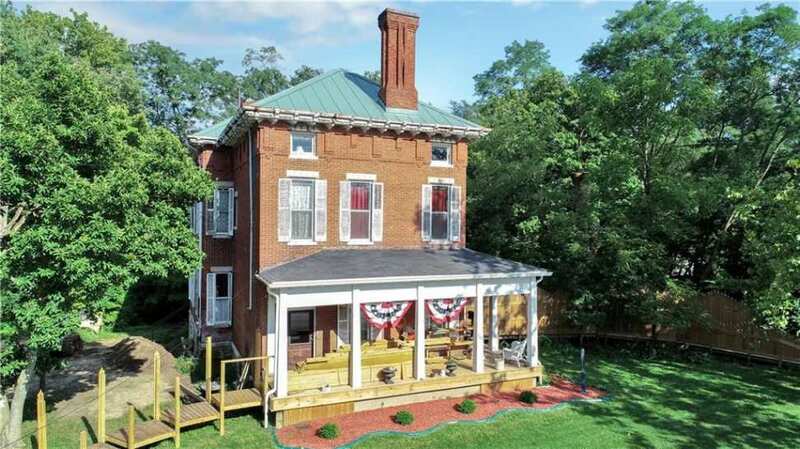 Again, unfortunate street view, but I could deal with that for this much house for the money. Kelly, you have outdone yourself! This is amazing. 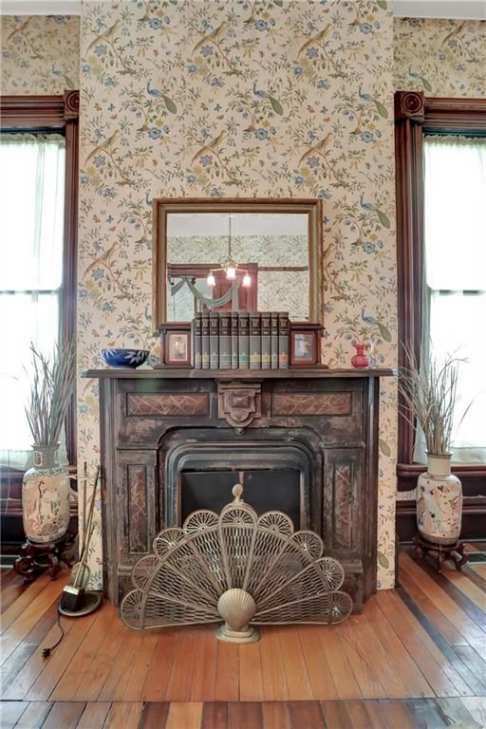 The treatment of covering the pipe next to the fireplace with matching wallpaper was genius. What a creative interior! Thank you so much for posting my now favorite house. The bath room door was what got me. 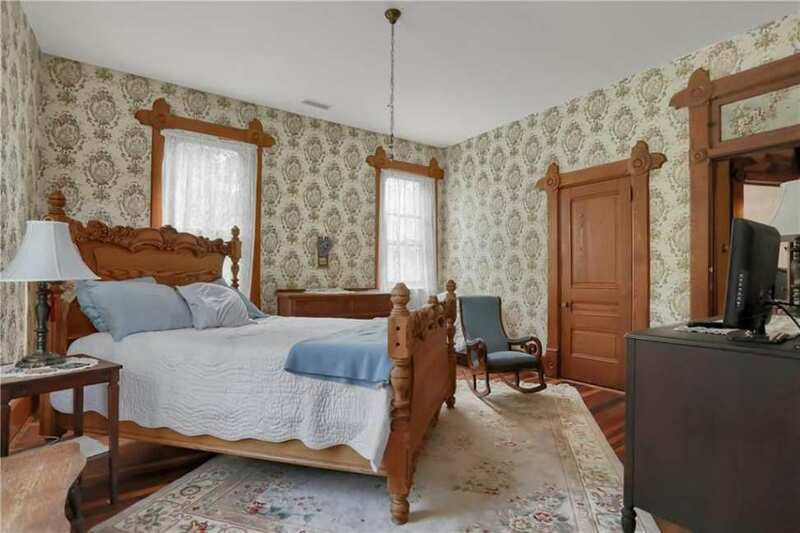 Of course the woodwork, windows, flooring attic space and unique touches helped a lot too. I wasn’t expecting such a fabulous interior based on the exterior. I much prefer the way the house looks in the google street view (2013) to whatever is going on now. If it was a wheelchair ramp I could understand it but it isn’t. Yea, my wife and I are looking at it and wonder, what the hell? ?, the original configuration was so much better looking. 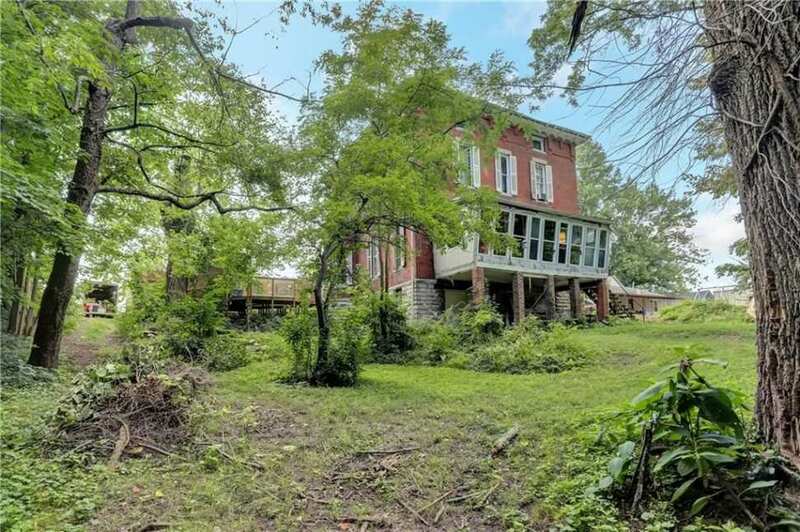 I hope someone can give us more info on this amazing house. 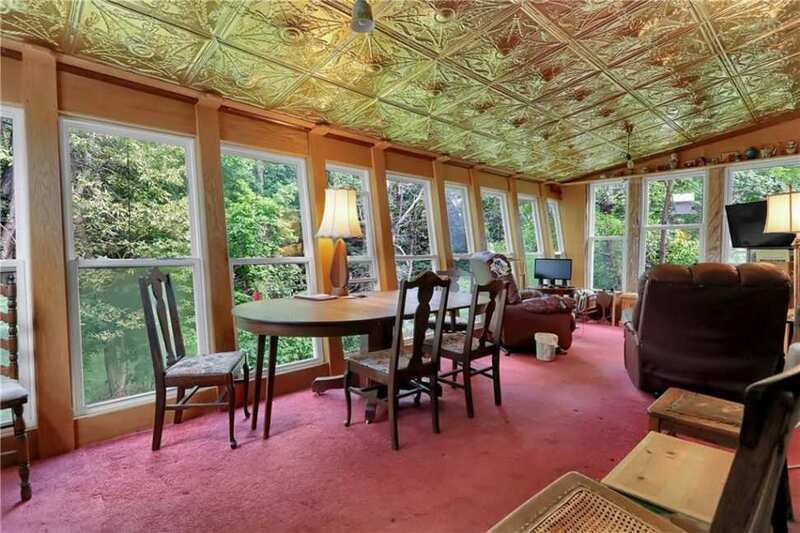 This might be my favorite house ever posted on this site. 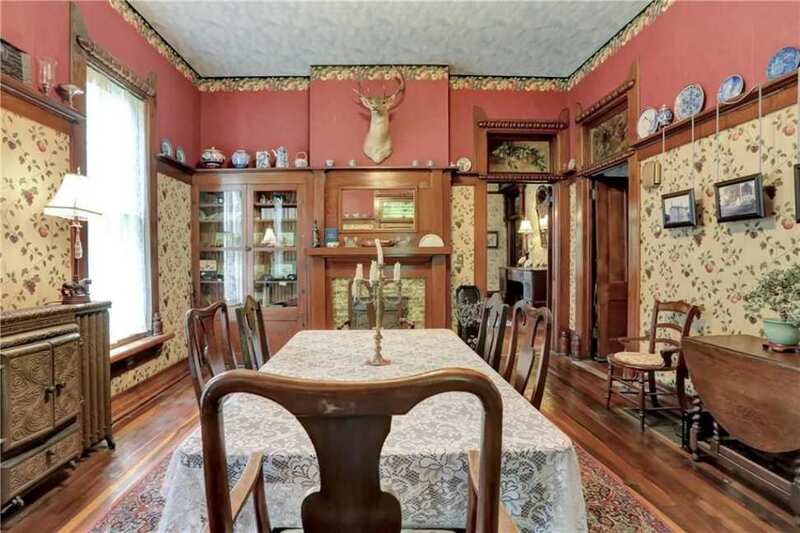 This house was built for William O. Goulding (1830-1902), a master carpenter born in Massachusetts, who successfully operated a planing mill for decades a block north of the house. He and wife Charlotte Adeline Day raised 3 daughters and lived here the rest of their lives. I imagine Goulding was responsible for some of the unusual woodwork in the house, though it appears a recent owner contributed as well. Very interesting! Awesome. I was scrolling past the pictures thinking, “Well, somebody owned a lathe…” Is Folk Italianate a thing? 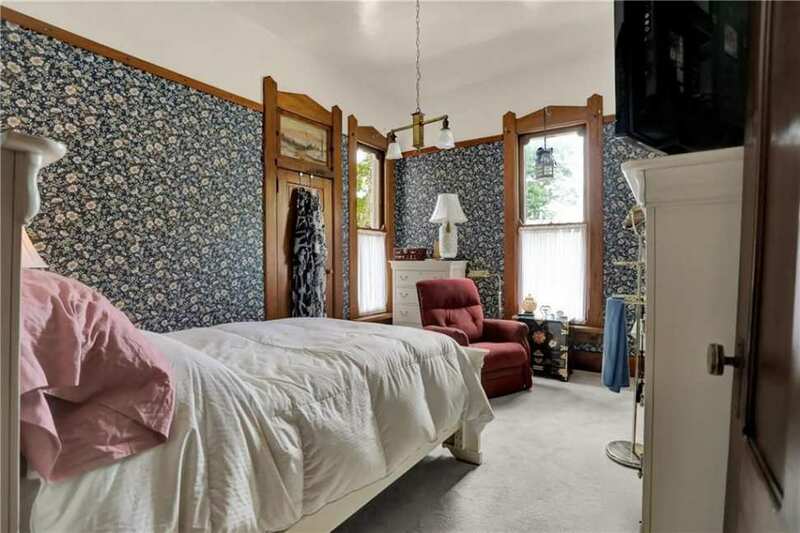 Because this house is totally a Folk Italianate. If there’s a ‘curtain guy’ then I might be the ‘newel guy,’ because it’s one of the first things I look for. To me there are so many clues as to what may have been in houses that have been redone, or to excite me as to what may yet to be seen. Build dates, level of finish, etc., can be gleaned in many cases, and this has to be one of the most unique newels yet! The town is home to Depauw University, and has a nice selection of 19th century buildings framing their town center. I agree! 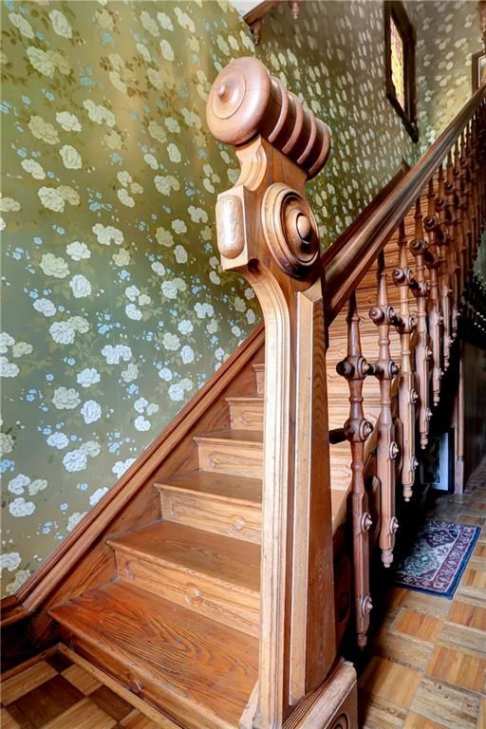 The starting newel post in this house is stunning in its uniqueness; very original and very imaginative. 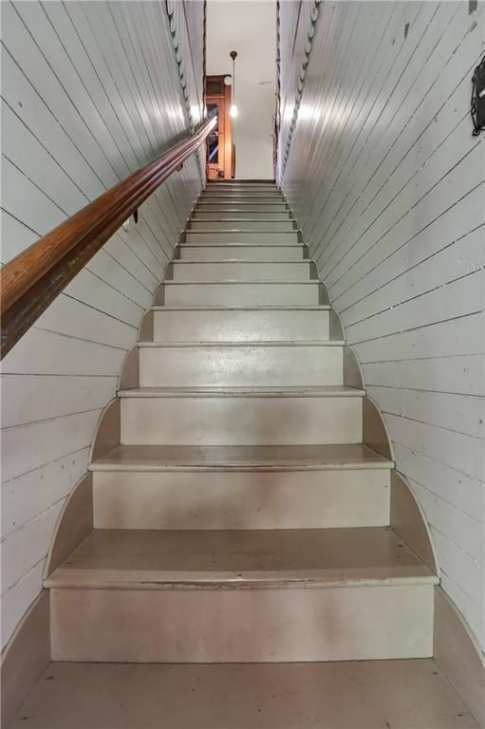 The entire staircase is reminiscent of some of George Hunzinger’s furniture – weird and wonderful! Is that a newel post? Or an alien life form? I think its a stylized prow of a Viking longship. Ok, I’m getting ready to duck here, because I think I’m the only one here who really doesn’t care for this house. 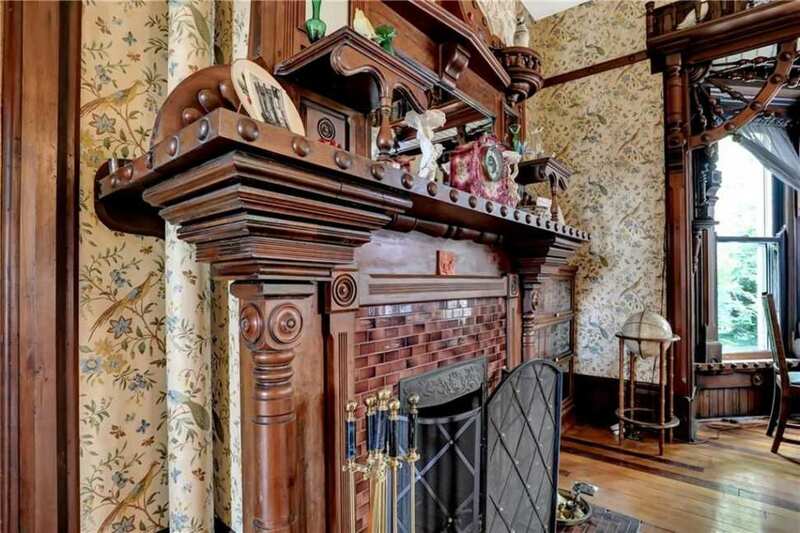 I love the painted transoms, but I think the rest of the house, the woodwork, that tin roof in the back screened in porch, and that one mantel downstairs, is just a bit too fussy for my taste. That the builder was a master carpenter makes sense. I think this house was his advertisement for his abilities and talents. And, I also don’t like the view across the street, but what can ya do, right? Ok, commence throwing bricks at me-just make sure they’re handmade, and pre Civil War. You have pretty good aim, Miss Apple37, but I still was able to duck! I’ll give yu another shot at me! LOL!!! Someone pass me the smelling salts! 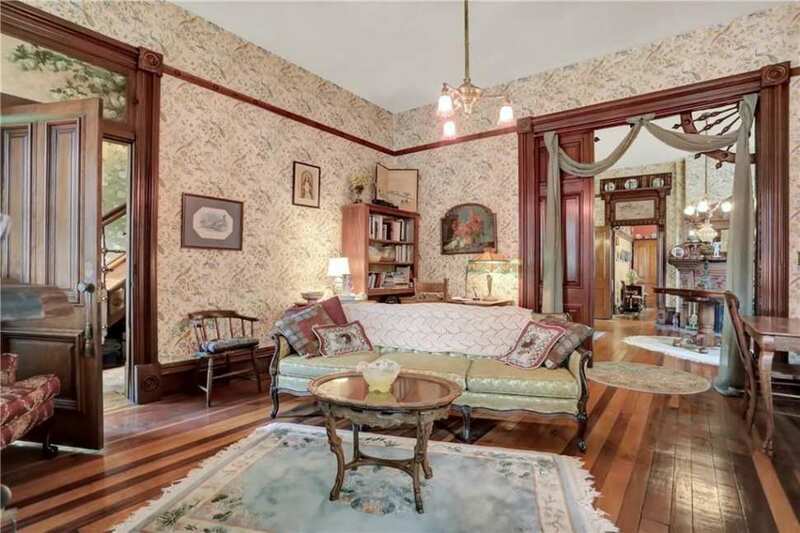 This house is absolutely stunning and remarkable and I simply cannot believe the price. Great find, Kelly. Karen, I too am going to likely draw ire but I can’t get over the front elevation. 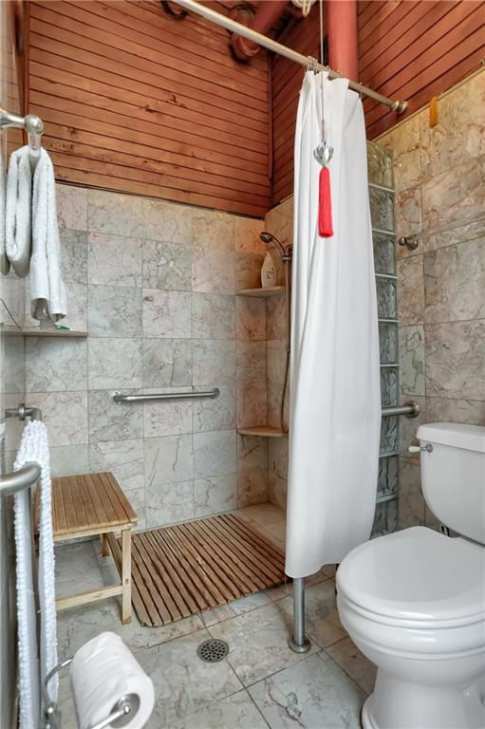 The location of the huge chimney seems awkward–to me. The overall house, VERY nice but the front view seems like the architect decided on a fireplace inside and didn’t think about integrating it to the outside. 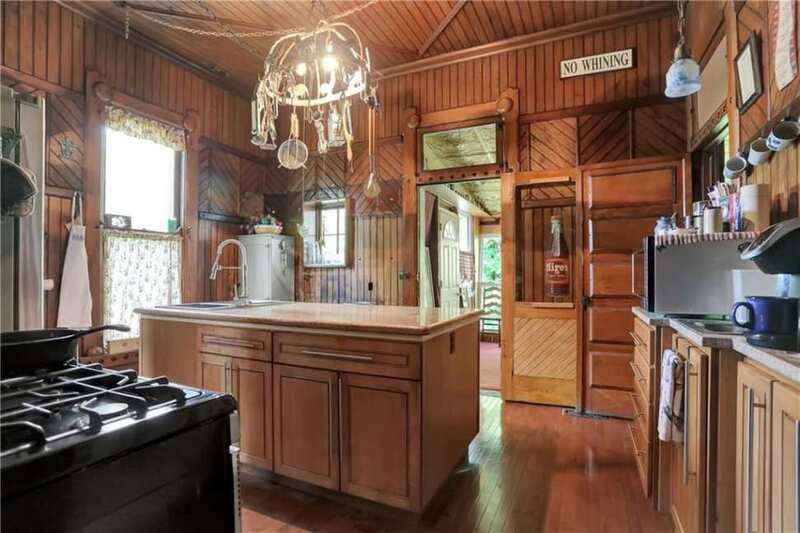 The woodwork, the floors, and especially that tilting ‘dutch’ door that looks like it’s for ventilation, maybe to the attic?–Whoo, beautiful. 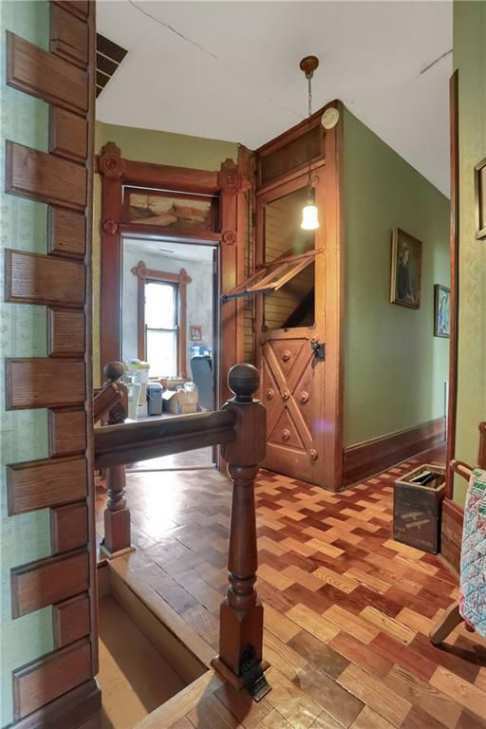 I was going to ask what that Dutch door was, to the attic, but I bet you’re right, that its to do with ventilation. Also, I was wondering who painted the transoms, and when. Maybe it was the last owner’s idea? Or, are they much older than that, and were done by the builder? I’ve never seen that, and its a very good idea! Kelly, each house posted today is better than the last one. I have to have this house. Love the painted transoms and just everything about it. 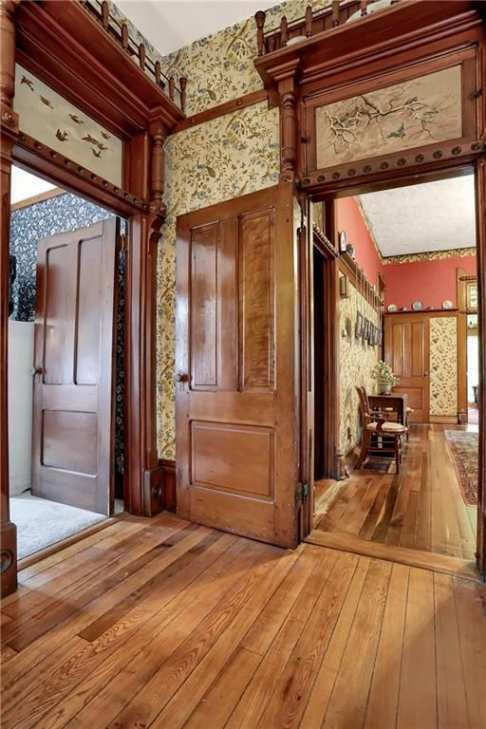 There are just no words to describe how much I love the woodwork in this house. 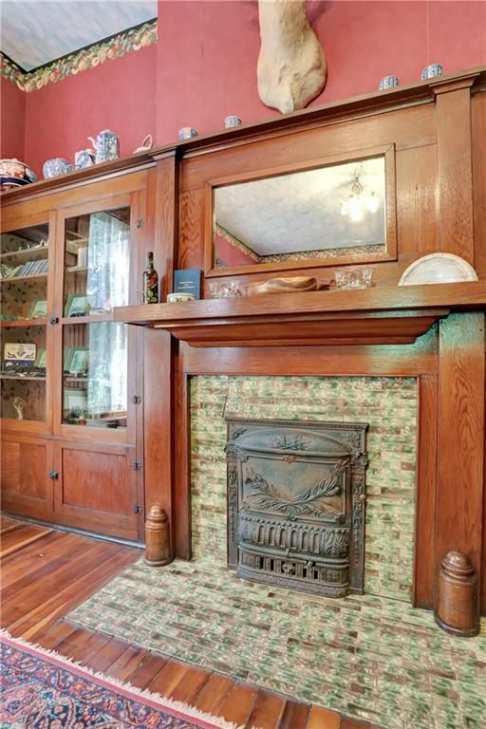 The rest of it is pretty great too,but my goodness….. the woodwork…..
Over-door/window frame shelves trim? Never seen that! Oh another trim in the kitchen! And in the bedroom! A marble fireplace! The newel post! The wooden floor on the upper level! 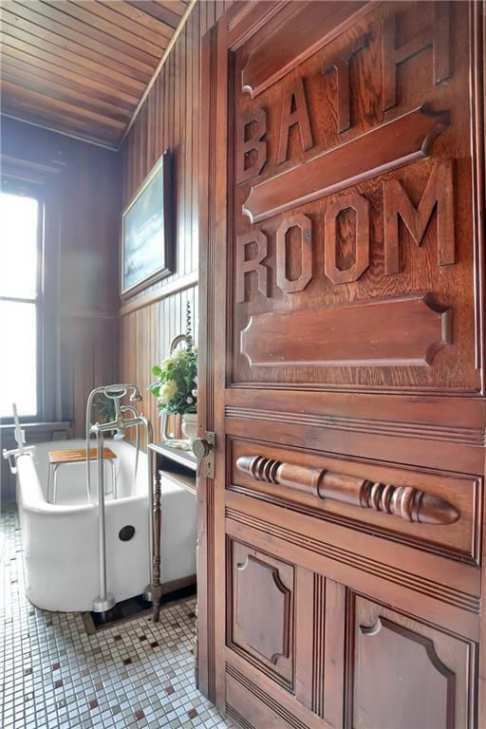 That bathroom door! stooooop! too much deliciousness! I’m fainting, my salts!! Incredible! The uniqueness of the woodwork kinda reminded me of the “chocolate house” in Boston, previously posted on OHD. Not as lavish, but at least very unique and stunning! Wow! What a cache of whimsical millwork! It has a delightful “Through the Looking Glass” sort of quality: the antithesis to Hill House in Shirley Jackson’s novella. Wow, wow, wow. Wasn’t expecting those bathrooms! 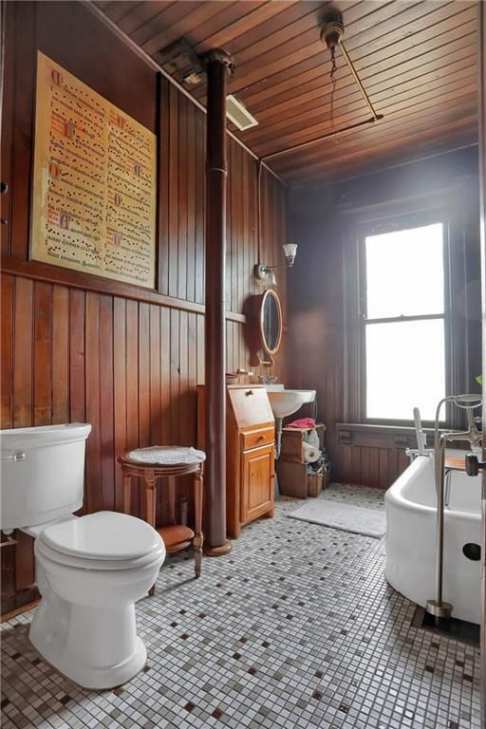 Do you think the bathroom door is original? I love the woodwork. Maybe because I used to be a millworker myself. This house is so good looking! One of my favorites! Now if we can just move it to Michigan! I’m no artist, but I’ve noticed a lot of artists’ studios have skylights. 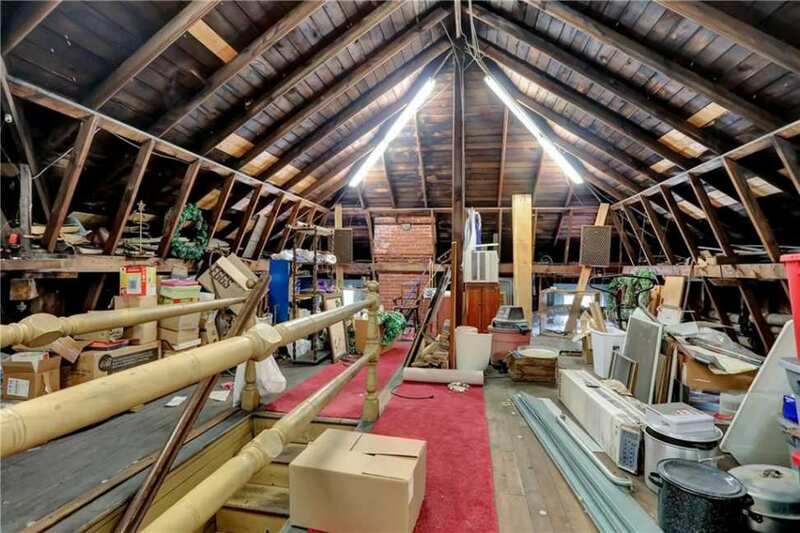 I bet that attic would make a great studio. Nicely done interiors but it wasn’t what I was expecting. The interior looks more like the builder showing his diverse ability. 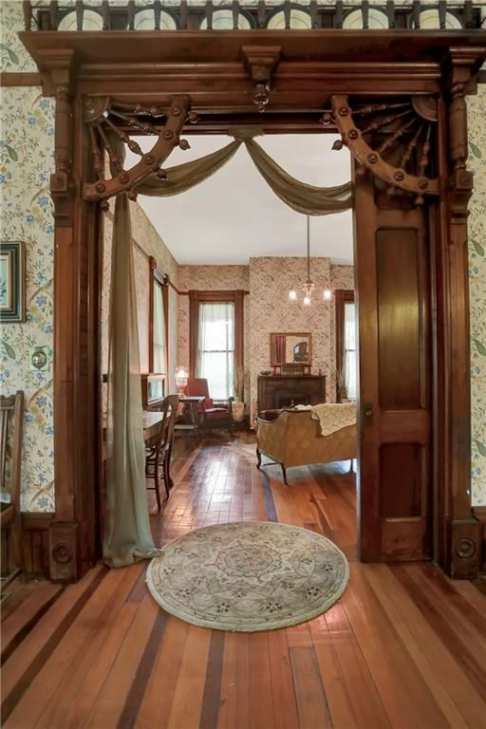 Could all the different trim patterns around the doors and windows be original? W O W !!!!!!! Going on favorites!!!! This house is the most. Not sure about across the street or what’s down the street. Wondering if u can plant small trees across the street along the sidewalk area. I am a retired from CHP and very much a artist. When I saw the attic. I imagined big canvas painting beautiful place to paint. How can I find out about the condition of the foundation electrical plumbing. You would need to hire an inspector to check out that sort of thing. 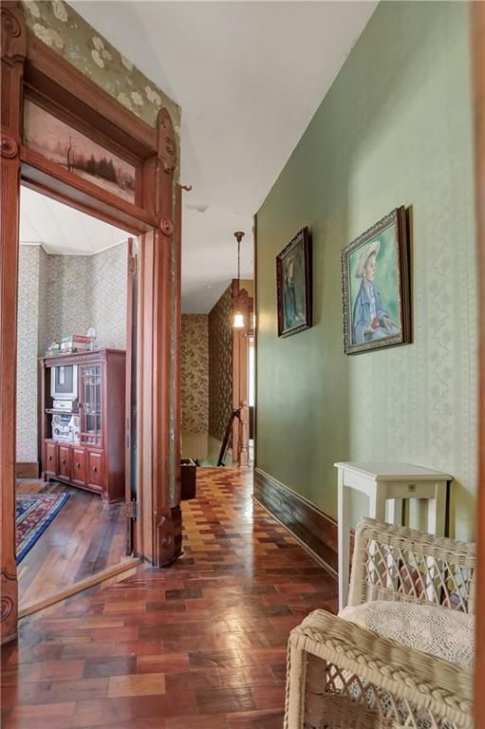 I just noticed the turned columns and the balusters in the attic stairway. This builder thought of everything! I’ve never seen anything like this one with all of that unique woodwork everywhere. I love it. It makes the house feel extra manly. It makes me feel like you’re in a lodge and about to go do some manly stuff. haha. Or maybe it was just the deer up on the wall that brought that on? The designs in the top of the doors remind me of the steering wheel for a ship (the helm?). 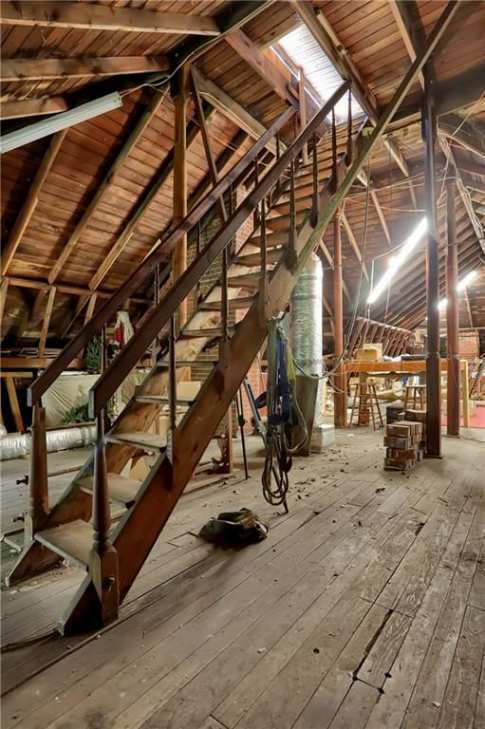 Then, when I get up to the attic, it’s like you’re actually inside a ship…an old pirate ship. haha. And, at first, I saw that front walkway and I was stumped as to why it was made that way. But, after seeing the inside, I had another look at the walkway and it was like a pier walking up to the pirate ship. haha. Maybe the current owner felt the same way? I was honestly ready to buy it! But then the street view brought me back to reality. The neighbors are way too close! 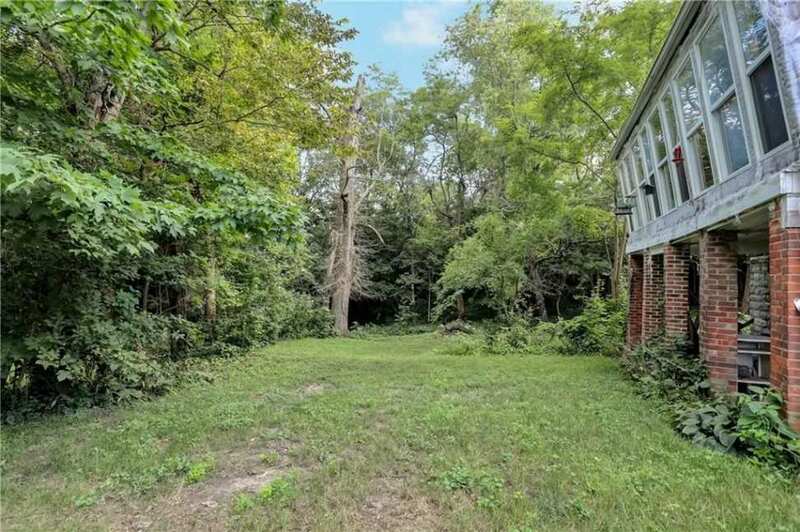 This place needs a huge yard. And no garage?! I wonder if you could build one off to the right side of the house. 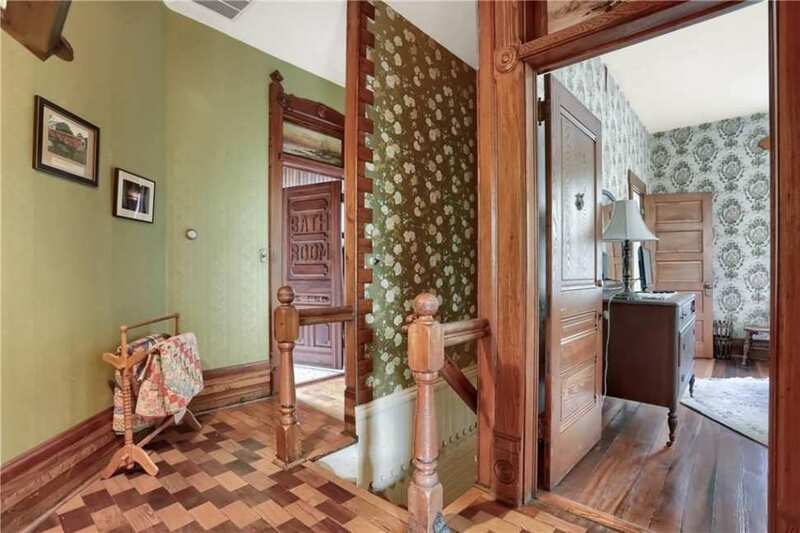 The house also sits a lot closer to the street than I imagined from the pics. But, if I could pick up the neighbor’s house on the left as well, I might consider. Sorry, it’s late and way past me bedtime. ARRRRGGGGG!